Nodji Van Wychen can make all of these treats and more! Nodji has learned many interesting cranberry recipes during her years as a cranberry farmer. 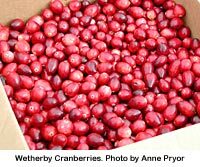 Cranberries are Wisconsin’s number one fruit crop. That means that lots of other people eat cranberry products too! How have you eaten cranberries? Nodji’s family has been in the red berry business for almost 100 years. Her cranberry farm is called “Wetherby Cranberry Farm” because that was the name of the farm when her grandfather bought it. Nodji grew up on the marsh and is raising her children on the marsh, too. Nodji’s grandfather worked on the same marsh her family now owns. They farm one hundred and ten acres of land in Warrens, Wisconsin, the heart of cranberry-growing country in Wisconsin. Many things have changed since the time her grandfather lived on the marsh. In his time, there were no irrigation systems, no insecticides, and no engine-driven machines. Everything was done by hand and equipment was pulled by horses. Today, Nodji’s family has tractors, bulldozers, excavators, back hoes, a cranberry-racking machine, and a water-reel beater. But one thing is the same as in her grandfather’s time. They still invent and make tools and equipment when there’s a need. Nodji loves to take groups on bus tours of her marsh during harvest season. This is the time of year when the marsh is most colorful. The cranberries float on the top of the flooded marsh and make a sea of red. But don’t be fooled! The beautiful berries at harvest don’t get that way without much hard work all year round. In the spring, the Van Wychens lay out irrigation pipes. The buds of the cranberry vines must be protected from freezing temperatures. To protect the buds, the Van Wychens use sprinklers. How do sprinklers help the buds not freeze? When water freezes, it releases heat. The heat that is released as the water freezes on the buds protects them. If the Van Wychens continually apply water to their buds and the water freezes, heat is produced over and over. In this way, the buds’ surfaces are protected from frost. Spring is also the time to plant new vines and start new cranberry beds. In the summer they clean the ditches on the side of the cranberry beds. They watch for insects and weeds. In the fall is harvest, from late September to mid-October. In the winter, the Van Wychens raise the water level in the beds to make a blanket of ice over the top of the vines. The ice protects the vines from the cold winter winds. In late January, they put a ½ inch layer of sand over the ice, so that when it melts there is more soil for the vines. Spring, summer, fall and winter find the Van Wychens with plenty of chores to do. Cranberry farming is a year-round job, like many other types of farming.